Data derived individually by the giant automakers is convincing them there is more to gain from a certain level of cooperation, than that provided by out and out, tooth and nail competition. Ford’s Full Research Report is telling them the need to alter their long-term strategy to not only retain but also build market share. GM’s Free Research Report revealed a need for greater fuel economy and operational efficiency as consumers begin to grasp the math of the higher mileage and lower maintenance built into new cars. The information was revealed by GM powertrain spokesman Dan Flores, who affirmed that General Motors and Ford are about to sign a Memorandum of Understanding regarding the development of “a variety of all-new fuel-efficient transmissions." Working together to standardize certain components could have benefits to both far beyond simple fuel economy. For example, it could lessen the cost of components for both, plus repair and maintenance costs, while providing downward pressure on part costs thanks to fewer parts to inventory. Discussions are still in progress, but an official press release is expected soon. "It would have huge manufacturing cost and volume advantages over all the competition," remarked Skip Nydam of ND-Automotive, an industry analyst firm. The effort to attain greater fleet-wide fuel efficiency is a costly undertaking and by sharing overlapping production needs the firms could cut their initial investment costs in developing new technology. "The biggest benefit in GM and Ford working together is it reduces their investment risk," said David Petrovski, a powertrain analyst at IHS Automotive. To illustrate, GM just spent $5 million with the new National Tire Research Center in Halifax, VA to further cutting-edge tire performance machinery to recreate real-world driving events. Redesigning tires could improve fuel efficiency up to 7 percent, which is why GM laid out the cash. Of course, both cars and trucks from each company needs tires and better economy, so why shouldn’t the automakers share the cost and benefit of the research? 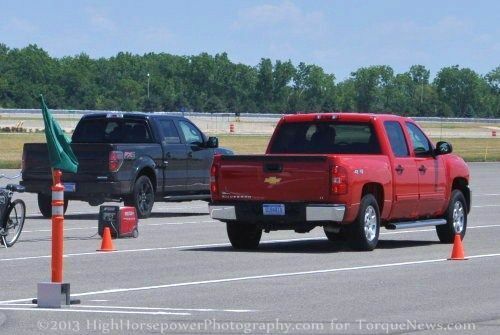 Meanwhile, Ford has hit pay dirt with investment and research into using turbocharging and direct-injection on smaller engines that resulted in the wildly popular EcoBoost engine. Now they are producing similar results with a turbocharged V6 with the output of a V8 plus much better fuel economy. Currently a full half of Ford F-150 sales carry the EcoBoost engines. This year, Ford is planning a new truck with a largely aluminum body making it 700 pounds lighter and that will raise the bar on fuel economy again. At 11 years old, the average age of American autos has risen to a record high, presenting a major opportunity for automakers to narrow the gap between the costs and savings a new vehicle can provide. Most automotive manufacturers are bringing fuel efficiency to the forefront of the automotive consumer’s equation. Today the savings at the pump from a newer, more efficient vehicle may offset much of the cost of financing or leasing a new vehicle. This pent-up demand has the potential to account for all the sales lost since 2008, spurring a major surge in new car sales. Buying new higher mileage vehicles, instead of maintaining old less efficient ones could pave the streets of America a much greener shade. Perhaps that day is finally dawning. Waht is next? Will Cats be sleeping eith dogs?